We chose to escape an irritating British Xmas and, hopefully, the worst of and the British winter for a second year running. Once again we planned to arrive in Spain on 21st December with a return ferry booked for 16th March. I was expecting much the same format this year. I was wrong. 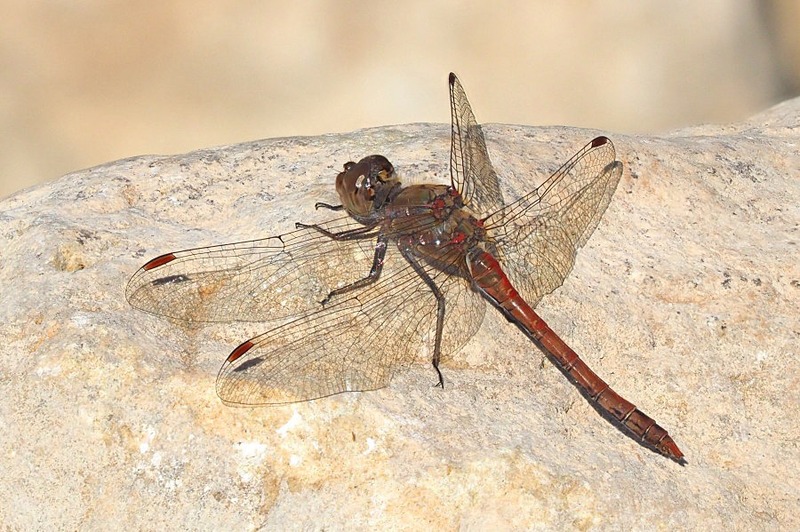 First of all, We spotted Common Darters into and almost to the end of February, our last date being 23rd February. 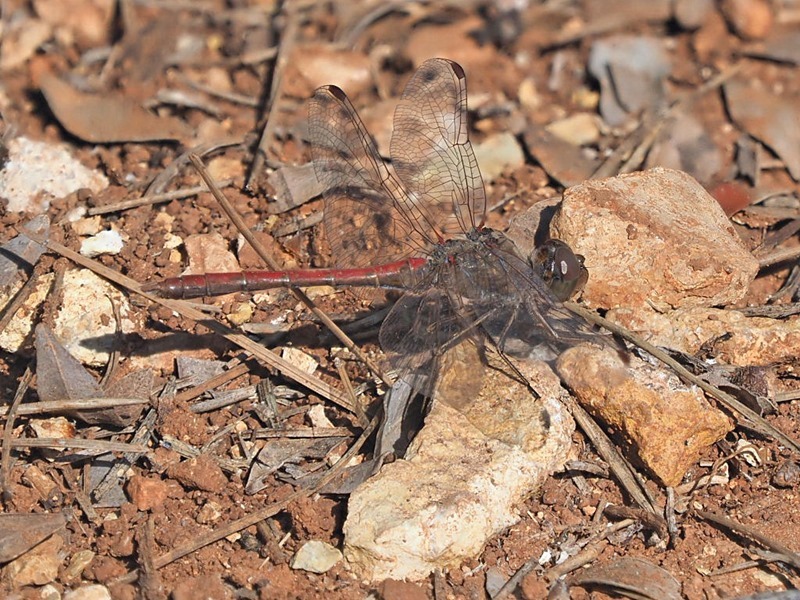 Secondly, probably due to a very dry and seemingly mild Spanish winter, a few species began emerging earlier than is normal at the beginning of March. These included Common Bluetail (Ischnura elegans) and I was very surprised to see Western Clubtail (Gomphus pulchellus). 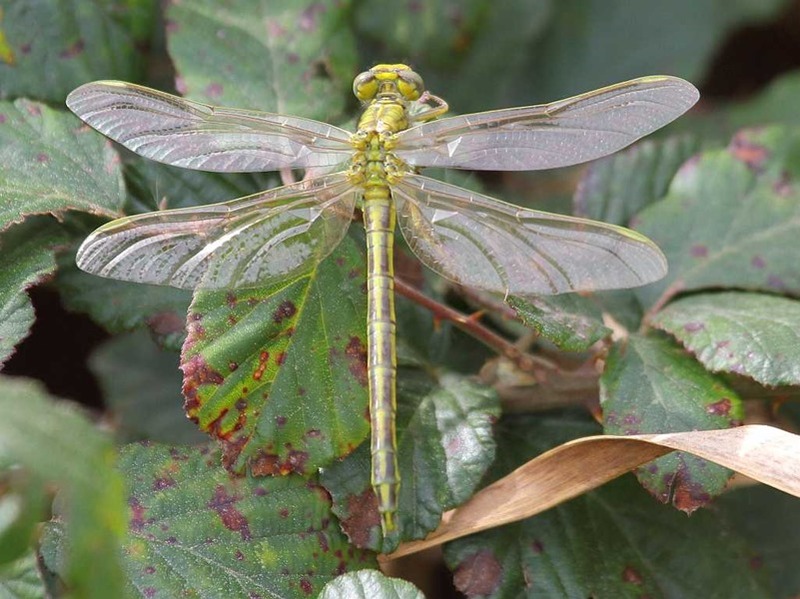 The winter was also notable for an influx into Europe of Vagrant Emperors (Anax ephippiger); an influx which included not only Spain but several sighting in the UK during bizarrely summer temperatures in February. Given the correct climatic conditions, thus species can turn up at almost any time from Africa. 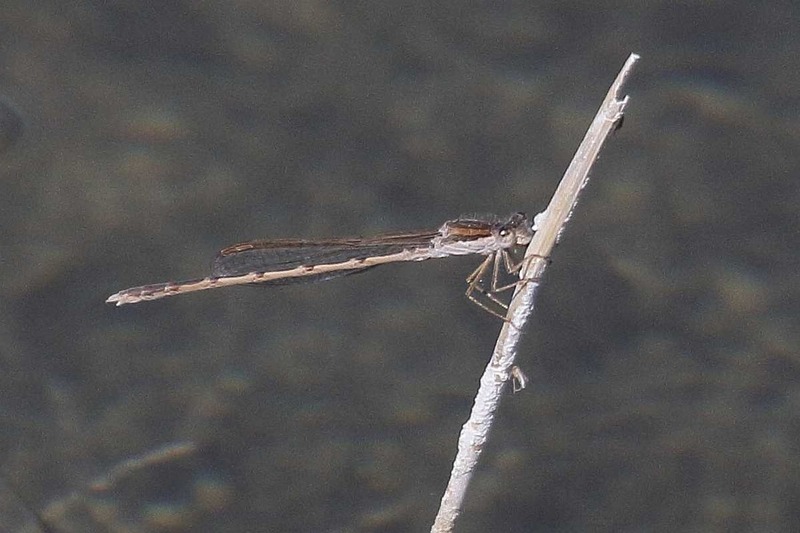 I was also excited to discover the existence of Winter Damselfly (Sympecma fusca) at one location. A local has suggested that this may have been the first record of the species at that site. Spanish recording being pants, I’ll probably never know. There weren’t too many locations producing the goods but here’s the map. Our first sighting here was the day after we arrived, 22nd December. On 24th of December, since the good weather and the Common Darters both continued, I pushed my luck by trying one of the tricks up my new camera’s sleeve: in-camera focus-stacking. I must’ve been very lucky because, almost unbelievably, my first attempt worked a dream. Our first visit was on New Year’s Day. We called in just because it was on our way back from a trip out. Surprisingly, there was a considerable amount of water in the river; more than I think I’ve ever seen before. I’m not sure why because I didn’t believe that Spain had had a wet autumn. The sun felt quite strong and the position quite sheltered. I really didn’t expect to find anything but the first suspect we spotted was an ovipositing female at the downstream side of the bridge. Upstream we found a couple of males basking on rocks. We returned on 26th January and found a male again basking on the rocks. That was our last successful visit. This was a complete surprise. Carol wanted to visit this Mediterranean garden. I, of course, was along for the ride. On arrival, we were presented with a map which showed a few water features. As expected, as is often the case in gardens, some were sterile and decorative. A so-called heron pond was more promising but quite shaded – nothing. 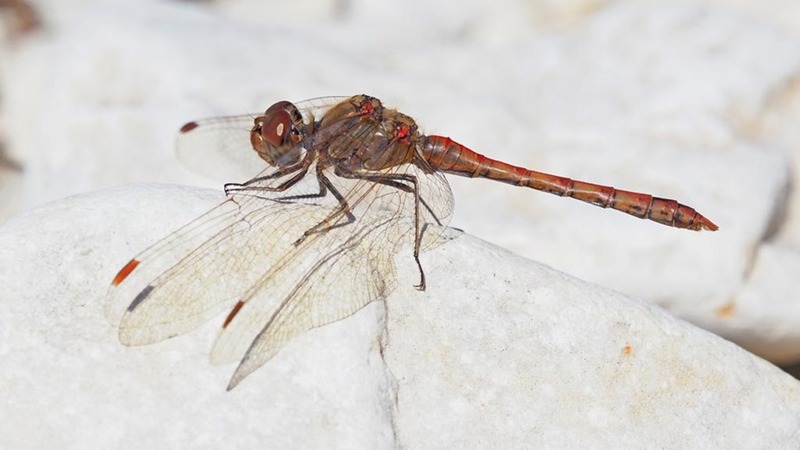 We found a slightly larger pool, off piste, which was clearly work-in-progress and a Common Darter zoomed past and settled on the ground for pictures. My new latest record. I always enjoy visiting this place; it’s just a nice day out and usually relatively quiet. It’s a 90-minute run south of Jalon so we arrived just before midday, then headed out along the boardwalk. INitially, birds were the only interest but they were entertaining. We got to the end of the boardwalk odo-free. I’d turned to return when what must have been a Vagrant Emperor zoomed by me just above the water. I didn’t see it again.m I did, however, see what proved to be a Common Darter flutter and settle in the reeds, too far away for any picture. It eventually moved to some grass where I did manage an identification shot (but not one I’d reproduce here). Carol spotted the real excitement as I was studying the Common Darter in the grass. In some sparse reeds on the same side of the boardwalk, she saw a damselfly. I could hardly believe it but then, I always forget about Winter Damsels spanning the winter. Eventually I found them – there were at least four including an ovipositing pair – and grabbed some recognisable pictures. A chap on a Spanish Dragonfly Facebook group thought this might be the first record of Common Winter Damsel (Sympecma fusca) at Hondo. We’ll never know but it was a thrill anyway. Our first visit produced two sightings, a Vagrant Emperor (Anax ephippiger) and a suspected Western Clubtail (Gomphus pulchellus), but nothing on pixels. I returned on 4th March, alone, and was drawing another blank on the pixels front when, almost back at the car, a delightful pair of very shiny wings alighted on a bush near me and to the right. It was, indeed, a teneral Western Clubtail. This really must be a very early record. I was delighted. On 7th March I returned with Carol when she spotted a Demoiselle land in the reeds on the opposite side of the track from the river. This was also thrilling because it was a Copper Demoiselle (Calopteryx haemorrhoidalis), a new species to me for this site. It was a male, They really are a delightful damselfly anyway. We also found a handful of fresh Common Bluetails (Ischnura elegans) on stems in the river itself. 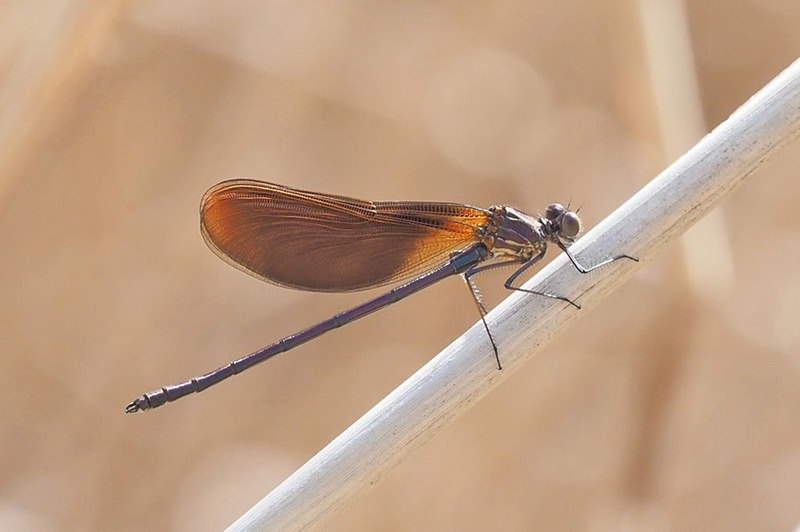 We returned again on 11th March and saw nothing until we investigated a stretch of habitat new to us and found a single fresh female Copper Demoiselle. What a terrific haul from one site for the first week of March.